We are an independent physiotherapy practice treating all muscle and joint pain, and mobility problems. Our approach is simple: we won’t baffle you with jargon – we’ll explain what’s wrong, and work with you to get you better. We treat everything from sprained ankles, shin splints, sciatica, lower back and knee pains, to rheumatoid arthritis, MS and post-operative rehabilitation. Muscle and joint pain makes day-to-day life difficult. But even a few sessions with our friendly, professionally qualified team of Physiotherapists can get you back to living your life to the full – making everyday activities easier. "The problem was completely rectified"
Just want to thank Dallas at North Yorkshire Physiotherapy for his immediate support in rectifying my lower back issue. Within 3 days, the problem was completely rectified with following the detailed stretches and exercise he gave me after a consultation. Riding my bike ‘pain free’ again feels great! "Provided a lot of help and support"
Dallas was terrific in dealing with my son Archie’s knee issues. He explained exactly what the issue was and provided a lot of help and support on managing his knees in the future. Would highly recommend North Yorkshire Physio. I would like to thanks Kate and everyone I met at North Yorkshire Physiotherapy for their professional care and kindness during my recovery from a recent knee injury. This was my first experienced of Physio but it was an extremely positive and beneficial one. 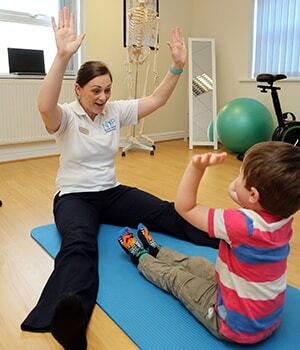 I work for North Yorkshire Physio and I find it a friendly place to work, we have a lovely welcoming atmosphere and do our best to relax and inform all our patients. The on-going well-being of staff is a high priority for Labman. It has been great to find a local company with the knowledge to come in and help with custom physiotherapy plans. Kate thank you so much for all your hard work which has improved my wrist and arm enormously I have so much better movement and less pain so fingers crossed this does get rid of the final bit! I am truly grateful for all you have done in improving my quality of life. We are closed on Good Friday and Easter Monday but open between 8am-1pm on Saturday morning, although the clinic is full.